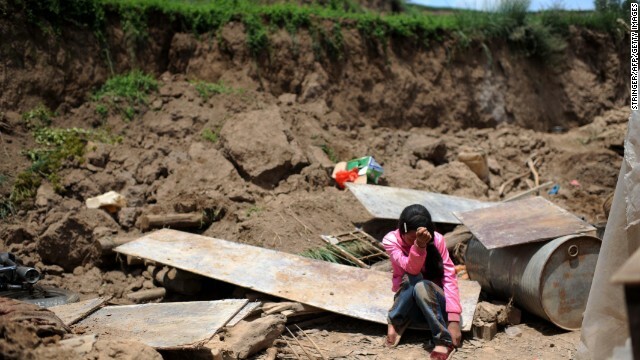 Song Xiaomei cries on Wednesday, July 24, after her home was destroyed by an earthquake in northwest China's Gansu province. 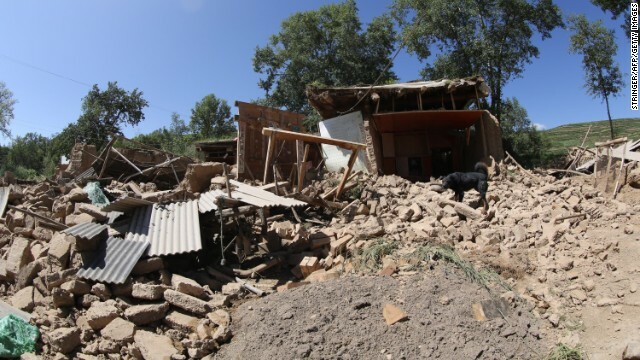 The strong, shallow earthquake and powerful aftershocks jolted the region Monday morning. The death toll is at 89, as of Friday, July 26. 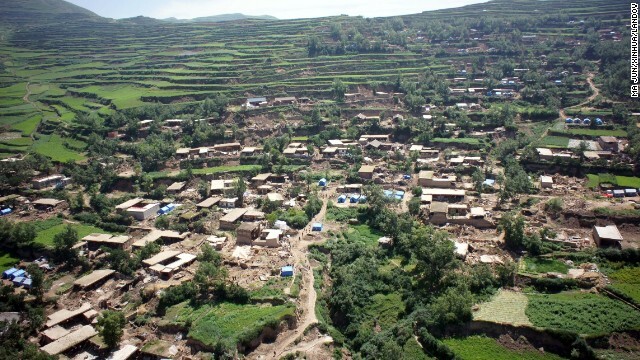 People look at damage on July 24 from a landslide triggered by Monday's earthquake. 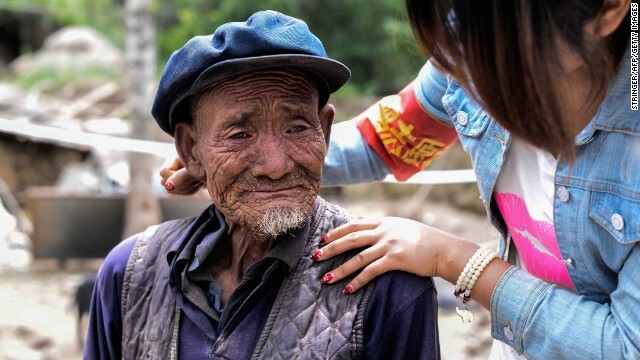 An elderly man weeps on July 24 after he hears he lost his grandson in the earthquake in Yongxing village. 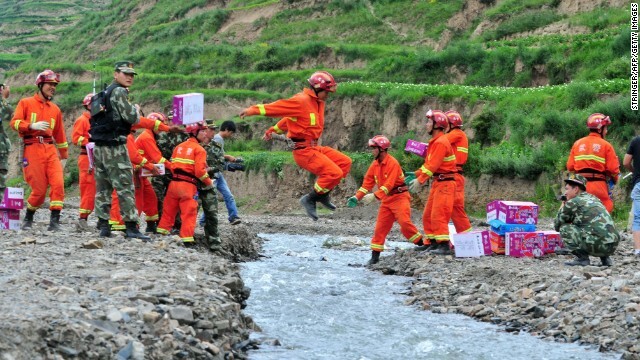 A rescuer jumps over a creek as a team brings relief supplies for earthquake victims to Digu village on July 24. 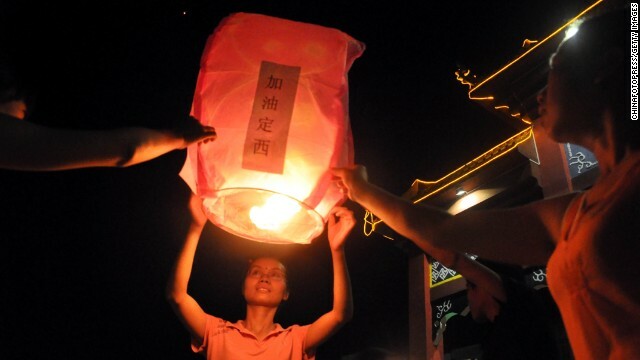 People pray for the earthquake victims in Laibin, China, on July 24. A man reacts after seeing his wife's shoes as rescuers search for earthquake survivors in Yongguang township, in northwest China's Gansu province, on Tuesday, July 23. 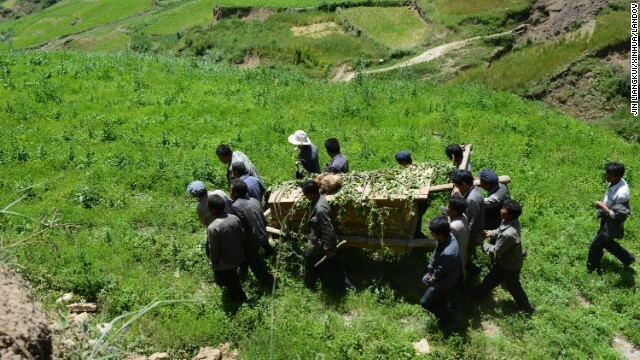 People gather to bury the dead in Yongguang, China, on July 23. 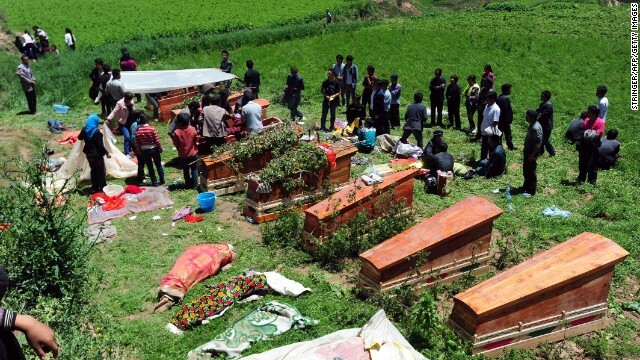 Villagers grieve in Yongguang, China, on July 23. 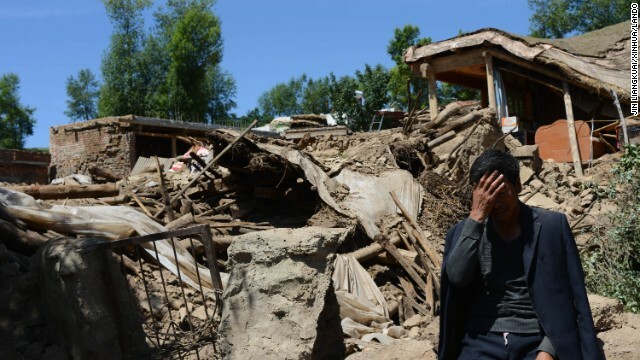 A man sits beside a collapsed house in Gansu province, in northwest China, on July 23. An aerial photo shows the devastation in the village of Yongguang in Gansu province. People carry a coffin July 23 during a funeral for an 84-year-old villager from Lalu who was killed in the earthquake. The death toll has risen to 94, local authorities said Tuesday. 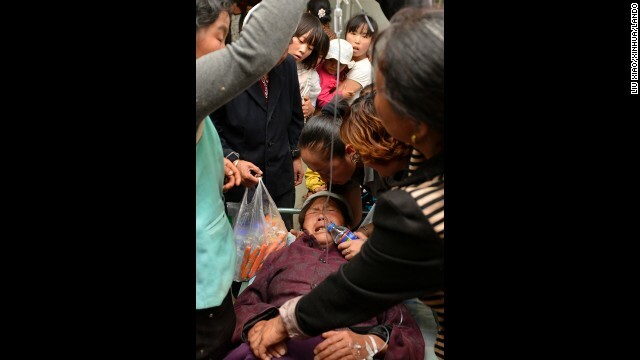 Villagers receive treatment from military medics in Yongxing, China, on July 23. Rescuers are searching for survivors in the aftermath of the quake. 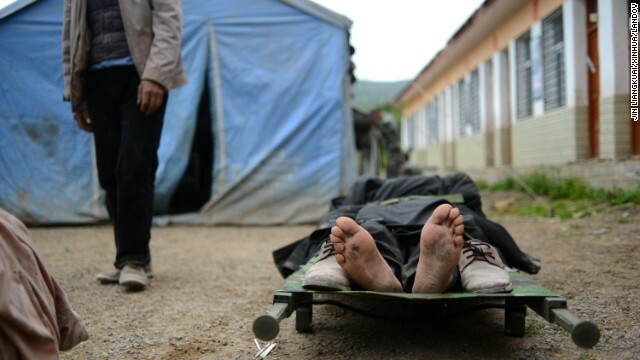 An injured person waits for treatment in Yongxing on July 23. 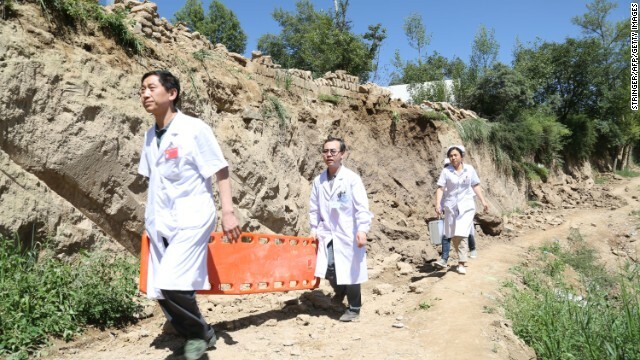 Rescuers search for victims in Yongguang on July 23. 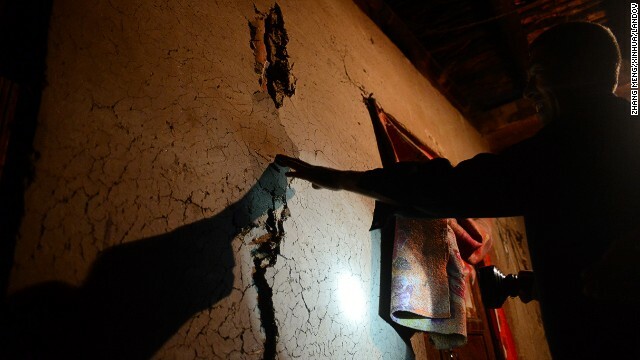 Hou Xuming examines the cracks in his house at Hadiha on July 23. 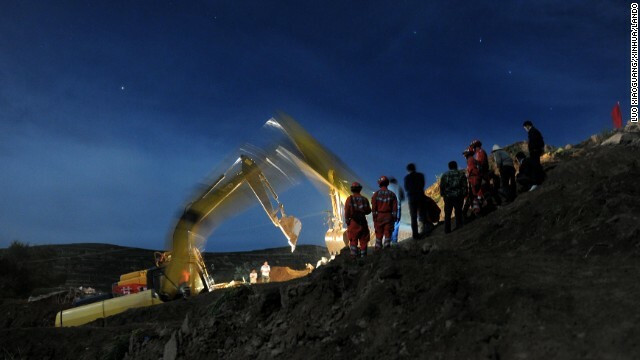 Rescuers work to clear rubble in Yongguang on July 23. 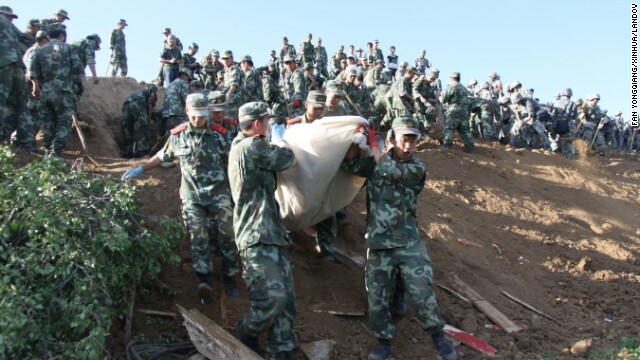 Military personnel work on a hillside in Yongguang in Minxian County on Monday, July 22. 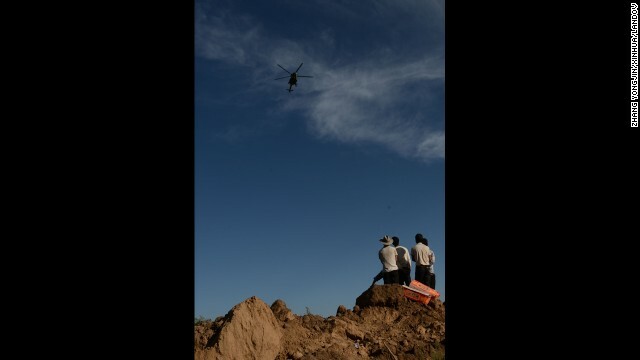 A helicopter airdrops relief supplies above Yongguang on July 22 as villagers wait on the ground. An injured woman receives treatment at a hospital in Minxian County, northwest Gansu Province, on July 22. 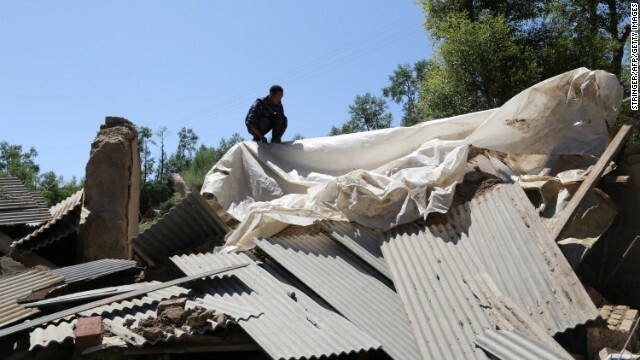 A man checks out a damaged house in Hetuo township in Dingxi in China's Gansu Province on Monday, July 22. 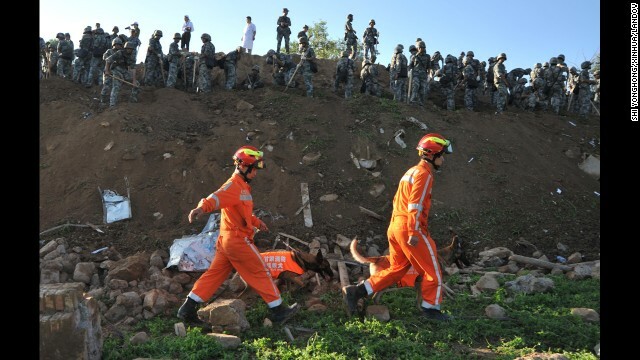 Rescuers look for survivors in the ruins of a house in Hetuo township in Dingxi on July 22. 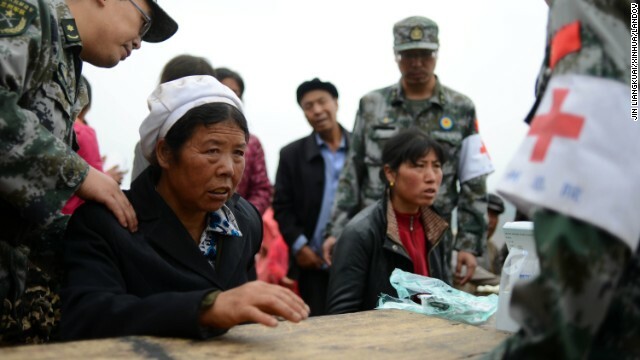 Emergency services are converging on the area, including the Red Cross Society of China, which is sending 200 tents and other supplies to help those left homeless. 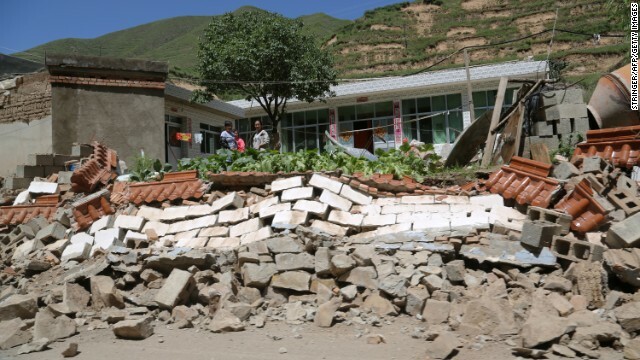 The quake leaves a wall collapsed in Hetuo township in Dingxi on July 22. 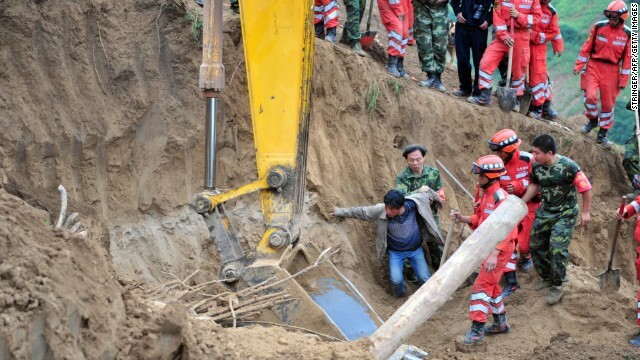 Chinese President Xi Jinping has urged crews to make the rescue of survivors a priority, according to state broadcaster CCTV. 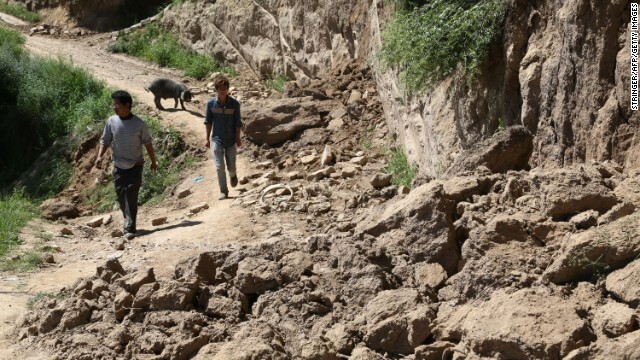 Two men make their way along a damaged road in Hetuo township in Dingxi on July 22. 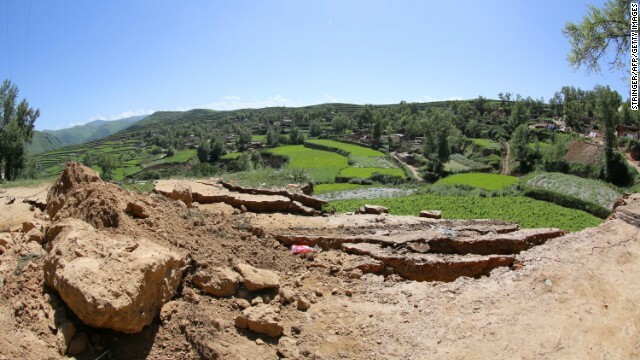 The original quake and powerful aftershocks caused roofs to collapse, cut telecommunications lines and damaged a major highway linking Gansu Province's capital of Lanzhou to the south, reports say. A dog stands on the ruins of a collapsed house in Hetuo township in Dingxi on July 22. 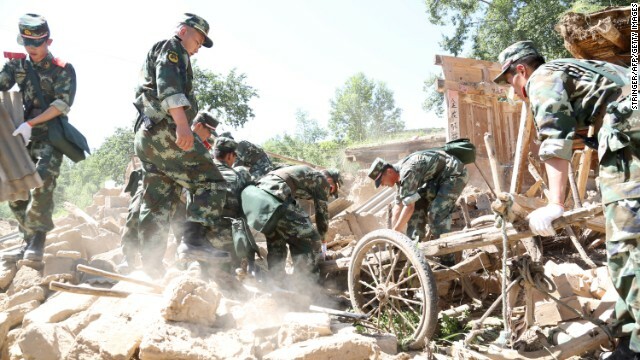 Rescuers clean up debris at Lalu village in Minxian on July 22. 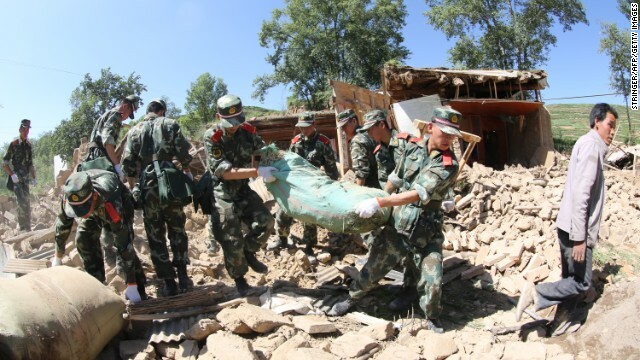 Rescuers arrive at Lalu village in Minxian on July 22. 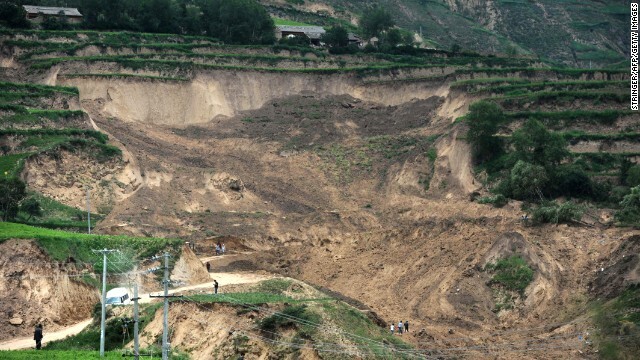 Damage from the quake is visible in Hetuo township in Dingxi on July 22. 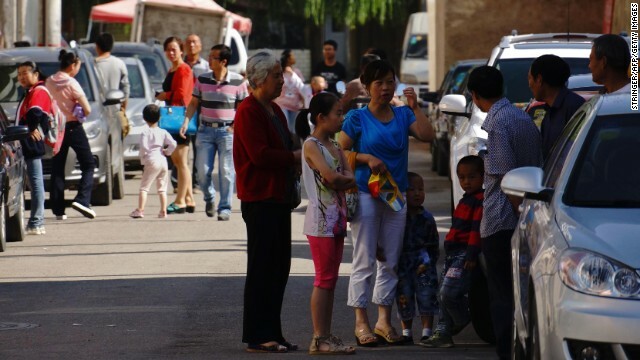 Residents try to take shelter after an earthquake in downtown Dingxi on July 22. Residents within the earthquake zone took to Weibo -- China's version of Twitter -- soon after to describe how the earth shook. "This morning at 7:40 I was brushing my teeth, all of a sudden everything shook for a few moments, I thought I didn't get enough sleep last night and was feeling dizzy," @wyyy wrote. "Turns out it was an earthquake, sigh, seems that with the huge rain downpour outside, we really don't know how much longer this planet is going to let us live here." 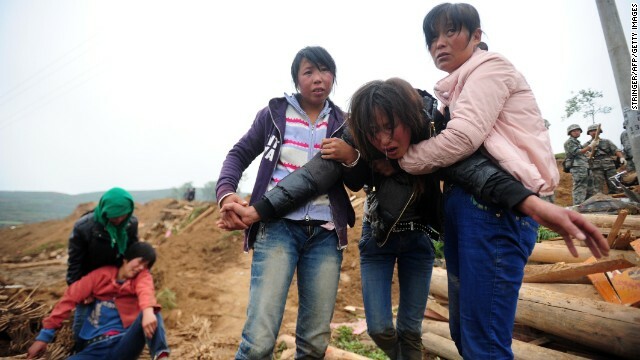 Another, @dengdjianjyany, said: "Gansu earthquake. So many natural disasters in so short a time, another flood, another landslide, another earthquake, another something. And it's not finished, my God ~ is there any safe place left? Wish everybody a life of peace"
@Heidiping: "Another earthquake, life really is fragile, survivors, be at peace!"